Welcome to my personal blog. It's going to be a random collection of things that I see/do/think with a broad focus on all things artistic and Los Angeles. Look around! Leave a comment! Sometimes, the work day, the traffic and life in general is just too taxing, and when 5pm rolls around, you need to head straight to the bar. Hey, I'm not judging you. 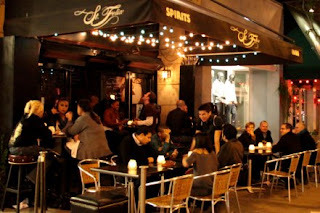 But with so many happy hour offerings in this great big city, it can be difficult to choose where to go, which is why I've put together a list of the best happy hour spots for your after-work rest stop. 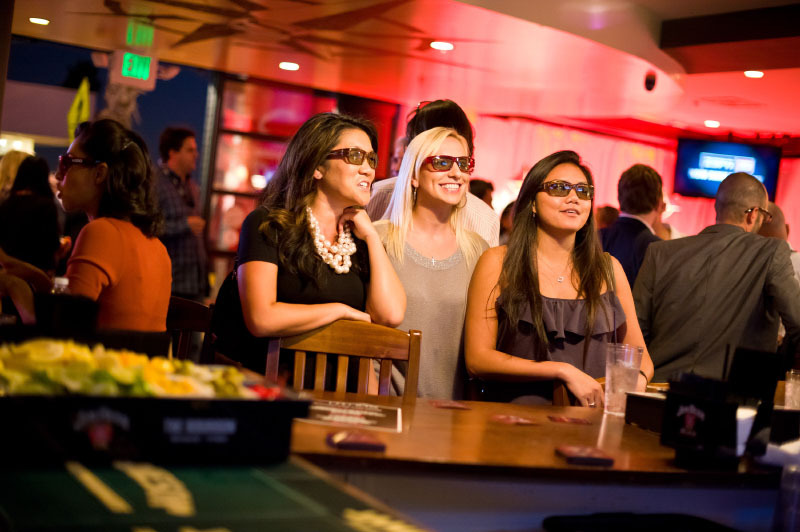 From $2 PBRs to gourmet steamed mussels, 3D TVs to watermelon martinis, L.A. Graffiti's got the details on its favorite happy hour destinations in and around Los Angeles. When one of the most atmospheric restaurants in West Hollywood doubles as one of the best happy hour spots, you know you've got yourself a winner, and the locally beloved Café La Boheme fits the double bill perfectly. Not only does their 5-7:30 happy hour feature $4 beers, $7 martinis, $5 wine and $5 "premium well" drinks (i.e., brands you've heard of that don't come in plastic bottles), but it's also a foodie's happy hour dream, with 50% off all sandwiches and "fun bites," which encompasses a wide range of delectable options including steamed mussels, bacon wrapped dates, and more traditional bar fare like quesadillas and sliders. All in all, it's a great way to feel classy, and tipsy, without bottoming out your bank account. 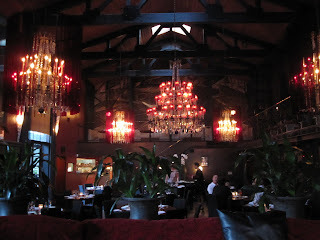 The 3rd Stop is a well known favorite among the Beverly Hills adjacent crowd with happy hours on Monday through Friday, 4 pm to 7 pm, and a menu boasting $4 draft beer (with a pretty eclectic and interesting rotating selection) and $4 appetizers, including a surprisingly large and satisfying pepperoni pizza. It’s a small, intimate spot where you can sneak in to dodge after-work traffic, chat up the friendly bartenders, and swap injury stories with the unlucky folks that may have hobbled over from neighboring Cedars-Sinai Hospital. 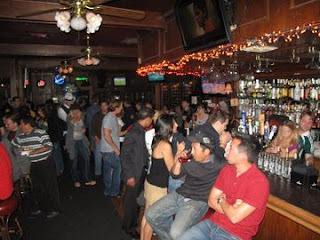 Right across the street from Sony Studios is one of my favorite dive bars, The Backstage, where the food is good, the atmosphere is always fun and most important of all, the bartenders pour heavy. 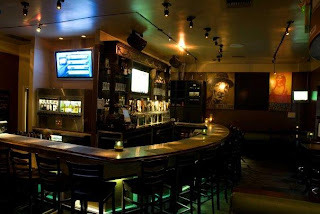 Unlike most places, The Backstage has happy hour 7 days a week from 4 pm to 8 pm and features an awesome food menu where everything is $5 or less. The drinks are already ridiculously cheap, with a can of Pabst Blue Ribbon costing only $2, but the food is the real gem as The Backstage has been voted “best bar food” by numerous local publications. The popular West Hollywood watering hole known as St. Felix has expanded to the Cahuenga corridor, giving you twice the opportunity for happy hour! 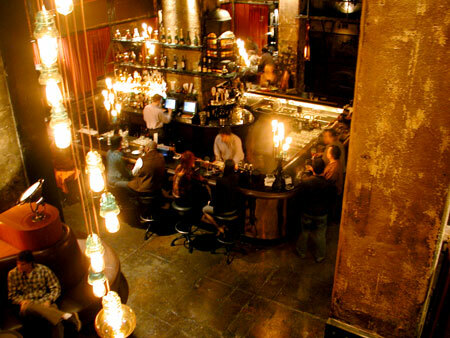 With specialty cocktails like the watermelon martini or the Stockholm Syndrom (Bombay Sapphire, rosemary, lime, mint, muddled strawberries and pomegranate juice) and a happy hour food menu featuring gourmet treats at around $5, it’s definitely worth making a quick detour before you make your way home. 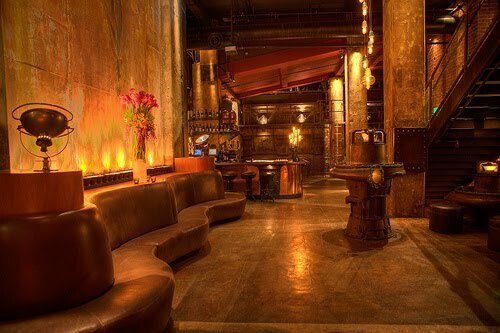 The Hollywood location, which took over the mismanaged Citizen Smith, is a much larger location and accepts reservations just in case you decide to bring your coworkers with you. The Edison, arguably the coolest bar in Los Angeles, sits inside of a converted Edison power plant and just teems with 1920’s glory. Their happy hours are legendary with amazing food, 35 cent prohibition-style cocktails and half off any bottle of wine on Wednesdays and Thursdays. If you time it just right, you can catch the tail end of happy hour and stay for the live music, which usually features some sort of burlesque dancing and often a jazz band. 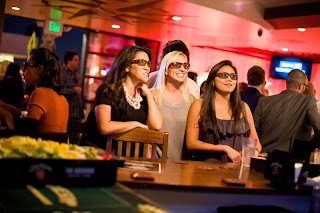 South, your Westside southern-comfort-themed sports bar, now features 3D TVs for an ultra cool sports viewing experience. Their happy hour is Monday through Friday, 4 pm to 7 pm and features a plethora of delicious southern comfort food along with some ridiculously cheap drinks: $3 domestics, $10 pitchers and $4 dollar well drinks. A word of warning: this is probably not the place to watch a sports event that you're only casually interested in, as it tends to fill up with what I can most diplomatically refer to as the "frattier" element. Pop your collar before entering to avoid detection. 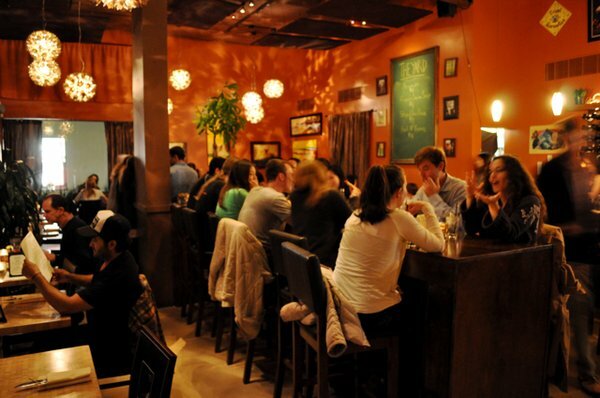 No happy hour list is complete without a sushi/Asian tapas restaurant and this list's oriental flare comes courtesy of Yatai, which has a super long happy hour on Monday through Thursday from 5:30 pm to 9 pm! Their happy hour menu features $3 beer, $5 sake, cocktails and wine, and $3 hand rolls and tapas! For Asian cuisine lovers, this is the ultimate gold mine! Bring your hachimaki and get ready to sake bomb your traffic woes away! While a burger joint probably isn’t at the top of your list for happy hours, The Counter actually has pretty awesome deals for your after work pit stop. Every Monday through Friday from 4 pm to 7 pm, all appetizers are 50% off and draft beers and wines are $2 off. The drink specials aren’t anything to write home about, but the 50% off appetizers are definitely noteworthy as you can get a large plate (enough for 4 people) of delicious parmesan fries for only $2.50! For a city that prides itself so thoroughly on its eco-yuppie, socially regulated sense of community, it's a shame that downtown Santa Monica mostly lacks the kind of institutions that could be considered "neighborhood" spots. 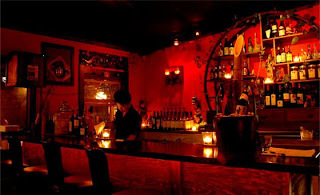 I say mostly, however, because of The Yard, a comfortable, unpretentious local favorite with the kind of laid-back atmosphere and superior food and beverage that you'd otherwise have to head north (to Montana) or south (to Main St) to find in Santa Monica. 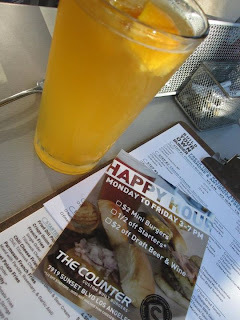 For their 5-7 happy hour, they dish out sliders, fish tacos and a few other $5-$6 bites, and what they lack in variety, they make up for by being absolutely delicious, especially when washed down with a $3 beer or $5 cocktail. Acting Advice by Jenna Fischer from "The Office"
I just couldn't resist. LOL! $5 Tuesdays: "21 Jump Street"
The Best Bottomless Booze Brunches in L.A.
$5 Tuesdays: "Act Of Valor"
L.A. Graffiti is a participant in the Amazon Services LLC Associates Program, an affiliate advertising program designed to provide a means for sites to earn advertising fees by advertising and linking to amazon.com. 2011 Andrew Chen. Travel theme. Theme images by lobaaaato. Powered by Blogger.